On Oct. 1, Archbishop José H. Gomez flipped the switch to launch El Sembrador (ESNE) Radio in Los Angeles at the Cathedral of Our Lady of the Angels. The celebration included a Mass and blessing of the station at noon, followed by a reception at the Cathedral Plaza Ballrooms. 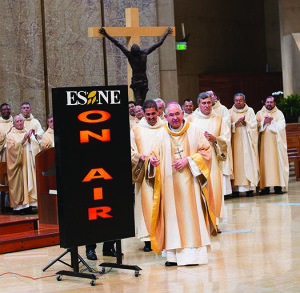 The expansion of El Sembrador Radio to Los Angeles (KTYM 1460 AM) means continuous Spanish-language Catholic radio coverage for more than 11 million in the U.S. and Mexico. KTYM 1460 AM is the seventh radio station in ESNE’s Radio Network transmitting to millions of Hispanic Catholics in areas of California, Arizona, Illinois and Mexico. This is the USA, not Mexico. People must learn to speak, read, and write English. It is wrong to exclude Americans in the Saving of Souls, as well as those of languages other than Spanish. and to assist in carrying civic burdens. This is a waste of money. Most Hispanics, even though they were Catholics in their native land, loose their faith once in America, and the radio station will fall on deaf ears. For that matter, how many Catholics watch Catholic TV or listen to Catholic Radio? Most of the programs are Catholic lite and do little or nothing to foster one’s Catholic faith. 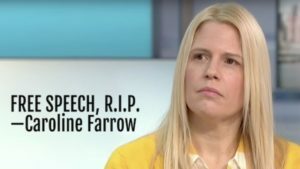 To reply to Pilar, Joyce, and others– Modern, post-1960’s liberal hippie filth, and misguided ideas– has infected and nearly-destroyed many cultures of the world! Including Hispanic cultures! Plus, the Church is no longer a strong backbone for cultures, such as the Hispanic families and societies, as in pre-Vatican II!! This spells DISASTER for the world!! Other world cultures, such as Hispanics, are much older, than babyish America, founded on Protestant concepts that are excellent, but have been recently discarded, by ignorant, barbarian, filthy hippies and liberals. Christ must be brought to the starving, sinful world– and if the clergy neglects their work— who will do the job?? Catholic radio and TV stations (such as EWTN, Immaculate Heart Radio, etc.) have done a great deal to help millions of Catholics understand and practice our Catholic Faith, especially in the terrible, tumultuous Vatican II era, with little or no good Church teaching available, in local Catholic parishes and schools. Catholic TV and radio stations are wonderful, and highly effective! They have evangelized many successfully, brought thousands back to the Faith who left, and have converted thousands also, to our Faith! Also, it is a wonderful thing, to have the Mass, Rosary, (etc.) and good programs available, for those who are ill and handicapped, or in nursing homes! Wonderful!! 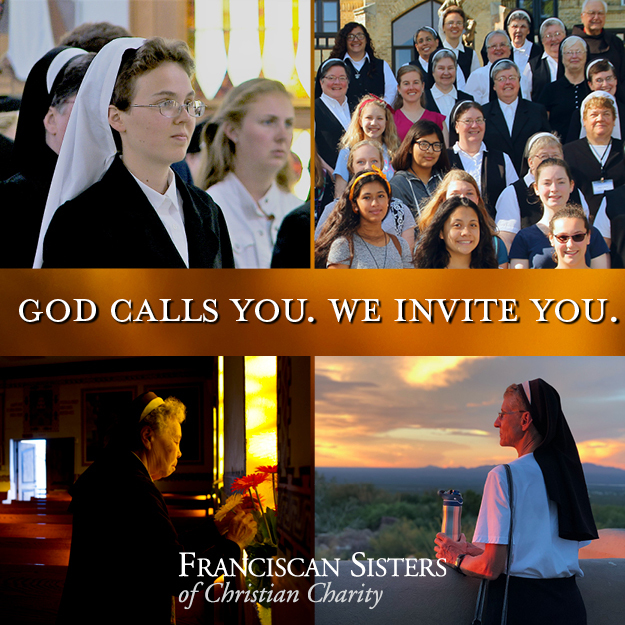 I have heard stories of many people, who were in desperate situations, who tuned in by chance, to a Catholic radio or TV station, and found hope, and totally changed their lives! For one thing, I have read stories of pregnant women considering abortions, whose babies’ lives were saved! Also, I have heard of people in immoral situations, who successfully changed their lives, practicing chastity and returning to the Faith. Wonderful! It is excellent that Los Angeles was able to start a much-needed Hispanic Catholic radio station, with a very large area that it will reach! This will bear much fruit, for the Church– and also, will help millions of Hispanics successfully, in other ways, too! WONDERFUL!! I’m not against Catholic radio stations, but what is the agenda of this new radio station? One of the important ways that Catholic radio and TV programs has helped, is by broadcasting programs related to the Catholic marriage, home and family. I have read many wonderful stories, of tremendous help given, that strengthened troubled Catholic marriages, and also strengthened relationships with children, as well as overall Catholic family success! This work has been sadly neglected, by local Catholic parishes, schools, seminaries, convents, monasteries, and universities– since the Church fell to pieces, after Vatican II, and contributed to the post-1960’s moral disorder and evil of the world!! These evils have infected many cultures of the world, and have been destroying Hispanic cultures, too! We used to have an English-language local archdiocesan radio broadcast, which was excellent– but it ended, years ago! There is a local TV Mass broadcast, however, which is wonderful! It is wonderful, especially for the sick and elderly, to have Mass, the Rosary, Stations of the Cross, and other religious devotions, on radio and TV broadcasts! It is also terrific, to receive broadcasts from the Vatican, of important events– like Christmas, and Holy Week and Easter Masses, as well as the historical events, when a pope dies, and a new one is elected. I used to love Bishop Sheen’s TV show, in the 1950’s! 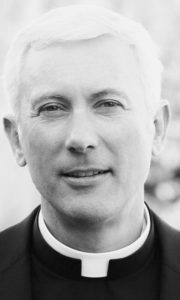 Sheen was the greatest– can’t replace what we lost, in the clergy, since Vatican II, sadly! Although I am in favor of Catholic media programming for Spanish-speaking people, what about English? In fact, English before Spanish here? Is there a pro-Spanish prejudice in favor of those who speak Spanish here?? What’s going on in the Catholic world here these days? My radio already picks up Spanish Catholic radio programming, and when I drive in other parts of California and other states, I can sometimes hear Catholic programmings in English. Let’s stop giving Spanish speakers priority here, when English is our national language! Just reading some of the post on this subject leads me to believe that the writers do not live in a very diverse part of the country where there are many radio and tv stations in languages other than English. In our area we have many stations in Spanish, Vietnamese, various Indian languages, Tagalog, etc.. Ours is a very diverse nation that is growing more Hispanic every day. In the LA area, the Church is a Hispanic church because so many people live there who speak other than English. Now, if we could just get a French or German station the circle would be complete. I will add one thing, to my above post. I think immigrants can learn to speak English better, on their own. They can also learn to assimilate into American culture, on their own. But Church MINISTRY should be SENSITIVE to the religious, cultural, and family needs, of immigrants, for the Church!! Will a Spanish Mass or Rosary, or good Spanish-speaking priests and religious speakers, help an immigrant Catholic Spanish-speaking family, and fulfill their religious needs?? If not– then, maybe the Mormons, or Protestant evangelicals, will try to successfully reach these immigrants, in the most effective way possible, for God— and convert them all, and effectively help them! I bet Pope St. John Paul II would have LOVED Polish Catholic religious broadcasts, on radio and TV!! He spoke NINE languages, but it was hard for me to understand him, when he spoke English! Bless him! Likewise, I bet Pope (emeritis) Benedict XVI would LOVE German Bavarian-regional religious TV and radio broadcasts, with his own beloved, familiar language, local religious culture, customs, devotions, saints, and etc.!! German Catholics, Polish Catholics, and Italian Catholics of the Vatican, each have their own, unique religious cultures!! This kind of ministry really helps to strengthen one’s Catholic faith, and brings the Catholic home and family closer!! All in favor of a Spanish Catholic radio station, I just wish it was more traditionally orthodox oriented like EWTN. I fear we are getting more of the heretical Charismatic movement nonsense. The Charismatic movement has been a scourge on Hispanic Catholicism in America. Heretical Protestant type Charismatic Pentecostal syncretism mixed with Catholicism. I do not think Spanish Catholic radio is trying to compete with, or replace, American Catholic radio, in English. I think it is only trying to serve immigrant Hispanic Catholics, and their families– in their own homes, as well as those in Mexico, across the border. Latin was never a universal language spoken outside of Mass for Catholics even in the pre-Vatican II era, unless you go back to the era when Rome ruled the world. I hope you don’t believe we pre-Vatican II oldies but goodies speak Latin! We would not understand it sufficiently well to choose to tune into it on a Catholic radio program unless we studied it in school, which not all Catholics did, I assure you. I say broadcast first in English, then shortly after that has become financially and otherwise a stable use of radio time, quickly add the Spanish language programming. Why is English being overlooked in favor of Spanish? This is the USA, Archbishop Gomez! We speak English here first. LATIN has been the language of the Catholic Church for centuries. LATIN is NOT SPANISH. All Seminaries, and Catholic Schools, and Catholic Universities should teach Latin for world-wide communication for our Faith. However, Bishops should communicate to the people in the language of the Country for which they are responsible. In the USA it is ENGLISH. California is NOT MEXICO. Abp Gomez is driving an additional wedge between Catholic Americans and Catholic Mexicans. He should ask to be transferred to Mexico. In reply to Christine, and others…Many Catholic ethnic families face a great struggle, when coming to this country! They are often so unwanted, by hostile Anglo-Americans, and struggle with possible moral, religious, and cultural disintegration, in the horrible Death Culture, here! I think Catholic radio geared to their own language and culture, is a hope for them! The Church only gives them a Vatican II superficial Mass, in their vernacular language, and their own secular, ethnic contributions to their Mass— that’s all! No moral nor religious training and help, after that! Their families suffer! Now, what?? I will add one more thing, in reply to Christine and others… I, myself, and my family and true friends, have all strongly felt like “foreigners,” in the filthy, sinful, post-1960’s America, and in the post-Vatican II Church! We have now been “foreigners” to it all, for many decades! And we will all die that way too, I suppose! But God always comes first! I will continue. As Latin was the universal “Church language, prior to Vatican II, a priest of any country or language, could say Mass, and offer the Sacraments, anywhere in the world— in Latin! Very simple! But of course, one needs a priest who speaks your own vernacular language, if you need personal help, such as for Confession! There were no modern, secularist, humanistic “gimmicks,” no pop psychology, no vernacular “multiculturalisms,” nothing of that sort, when you went to church, worldwide! It was very religious, straightforward, and very serious! With the focus oriented only towards one thing, God! That’s all! To Maryanne Leonard– are you aware that there are Catholic radio stations, such as Immaculate Heart Radio, EWTN radio, as well as other stations– that broadcast only in English? 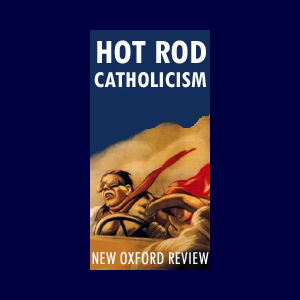 With the English Novus Ordo (Vatican II) Mass, and religious devotions? 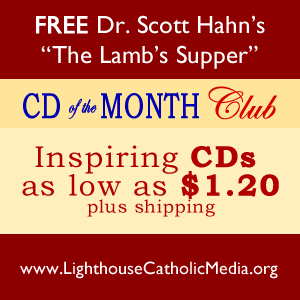 Everything is already available, on Catholic radio, for English-speaking American Catholics! Long before Vatican II, I heard some very tragic stories, from people of Mexican descent, that their families, as well as those of other races, were made to always sit in the back of their Catholic parish churches, in America, due to racism. Makes me SICK!! Not all Catholic parishes committed this evil sin– but some parishes were VERY GUILTY of SIN in this manner! Those who committed this sin, in a church, before God, must answer to Almighty God, for their horrific sins!! And of course, Linda Maria, you will name the parishes in which this happened. Why not also list all the parishes that would not let African-Americans sit in the front of the church, mush less enter it. When you make statements like “I heard tragic stories” you are acting very much in the same way that Senator McCarthy did in the 50s. He ruined the lives of many people with his unnamed sources. We need to talk about how we can minister to all Catholic families going forward, not based on the past. Bob One, if the Church wants you to have a Spanish Mass— then, what is so wrong, with the Church having a Spanish Catholic radio station?? And yes, lots of Anglo-Americans DO NOT LIKE NEWCOMERS!! It is hard for many new immigrants, of all types, to assimilate into today’s immoral, liberal, leftist, Godless, dominant Anglo “Death Culture,” in America! They face disintegration, morally and spiritually, and massive destruction, to their family life! Of course– when you go to new country, it is only right, to fully embrace it, learn its language, and become a true part of it!! Once cannot change the facts that Los Angeles and for that matter California is a HISPANIC city and state, Los Angeles is a “Hispanic” city so it makes sense that it is in Spanish, but the TLM should be the Mass to link all peoples together. Any Hispanic who wants to live in the USA – must learn to speak ENGLISH. If we go to Mexico to live, we should learn to speak Spanish. We should not give up any part of the USA to foreign desires. We have to do something about ILLEGAL immigration, and the Illegal actions of Sanctuary Cities. Just because you hear an Hispanic person speaking Spanish does not mean they can’t speak or don’t want to speak English. If you went to Mexico, you’d probably learn Spanish, but you’d also still speak English to your family because you can express your thoughts in English better than in Spanish – or Tonga. And you’d appreciate spiritual messages delivered to you in the language you grew up with, because you are likely to “hear” that message in all it’s depth. I agree with the post of Anonymous! I agree with Janek! The 2,000-year-old beautiful Tridentine Latin Mass, was once a powerful unifying force, for all Catholics, worldwide! LOVE it! Maybe some of you would love to settle this question, by telling the USCCB to get rid of all ethnic language Masses, devotions, and religious materials, in the U.S.!! Just have only ONE vernacular-language Novus Ordo Mass— in American English!! Is that the best thing to do, do you think??? What about our recent Popes, saying the Novus Ordo Mass in Italian, all the time, in Rome?? Maybe that is a hardship for them?? Perhaps Pope St. John Paul II would have preferred the Polish Mass, Pope Benedict XVI may have preferred the German Mass, and maybe Pope Francis would prefer the Spanish Mass, with Argentine dialect!! The Fathers of Vatican II wanted everyone to have their own updated, modern Mass, Sacraments, and religious devotions and materials, too, in their own modern, vernacular language. I, myself, just prefer only ONE Mass- the nearly-2,000 -year-old, beautiful, authentic, Tridentine Latin Mass, Sacraments, and religious devotions! That is all I will ever need, as a Catholic! But not everyone is the same!